My boyfriend and I are paddling all 2,552 miles of the Mississippi River in a pair of kayaks. And the near-constant rain is creating some serious flooding. That makes the paddling difficult and dangerous, sure, but there’s other hazards too. Since our departure from Minnesota’s beautiful Twin Cities 20-odd days ago, the Mississippi — a waterway which we are attempting and, so far, haphazardly succeeding at in traveling the length of — has seen a dramatic transformation. Gone are the rolling waters that meandered lazily back and forth through the north woods, replaced by a highway of industry marked with red and green buoys that float on its surface. Tracing our route from St Paul, Minnesota to our current position, just south of Cairo, Illinois (the official end of the Upper Mississippi) these beacons indicate to the huge barges the path of the Army Corps of Engineers’ guaranteed 9-foot-deep channel. A lane which we occasionally dart across, but mostly attempt to avoid, preferring instead the relative safety of the river banks. “Safety,” in this case being a relative term. The shallow areas have become the preserve of the concussion-causing Asian Carp. The very same culprits responsible for the closure of the St Anthony Falls Upper Lock and Dam. Now having had one of these fish, which typically weigh 35 to 40lbs, jump out of the water and thud onto the deck of my Wilderness Systems kayak, I suddenly find myself no longer amused by the cartoon-like image of a person catching one of these river dwellers to the face. They’re talking about the debris, first. Stationary at the lock pull cord, where we have had to wait before “locking through” 29 separate times, my kayak has been hit by trees (and I mean actual trees, roots, branches, limbs, leaves and all), tables, tyres and even once a garden trellis. Second, with us being budget campers, finding a place to pitch our Brooks Range tent is something else we need to be careful with. With the floods, there’s been no sand bars, no solid ground, just the trees and tops of vegetation poking out of the water they’ve been swallowed by. Even the landings and public access areas are being eaten by the rising river. 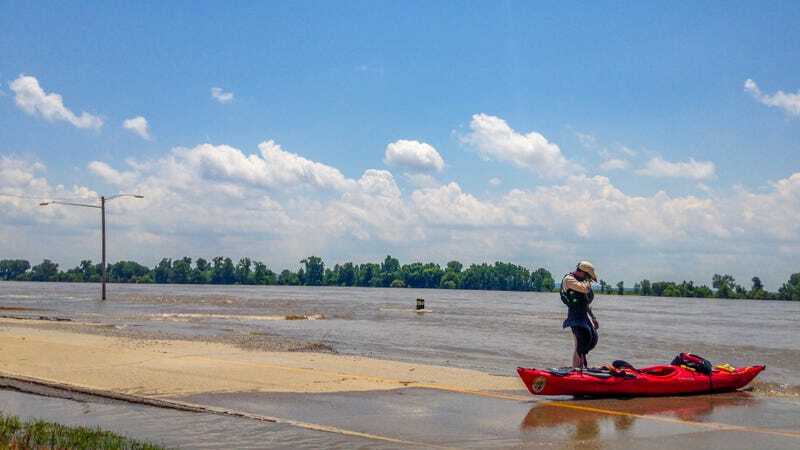 Third, with the Illinois, Missouri and many other tributaries also experiencing flooding of 10 feet or more, the Mississippi itself is now running at double its normal speed. That leaves giant whirlpools, erupting boils and a variety of other strange and strong currents for us to deal with. That’s added to the huge, seven-foot waves created by every passing tug. But for all these hazards, we have still managed to setting into an easy rhythm of paddling. A trance-inducing monotony of strokes broken by bouts of navigation and the occasional paddle high-five. This is unlikely to change soon, for the rest of the way to the Gulf, we’ll just become smaller and smaller fish in an ever-expanding, and ever-rising river.